If the Contours’ “Do You Love Me” was Motown at its most raw, “You Beat Me to the Punch” was really where the “Motown sound” started to be defined. The vibes in the background smooth all the rough edges while the bongos add an extra bounce to the melody. 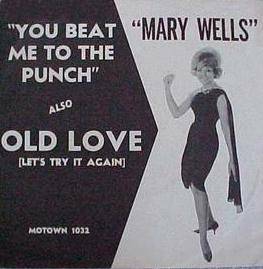 Backing vocals from the Love-Tones add to Mary Wells’ delivery without distracting from it and foreshadowed the relationship this song’s writer, Smokey Robinson, would have on record with The Miracles. Wells sounded insecure in her debut single, “The One who Really Loves You,” (although the pedestrian songwriting doesn’t give her much to work with), but she nails the surprise and thrill of new love here. Smitten from the first time she saw her man, the shy girl is delighted to learn her feelings are reciprocated.